Several different beans, split pea and barley along with pasta and sundried tomatoes and a tasty seasoning packet make this a family favorite. And it's loaded with fiber. Makes approximately 9 (1 cup) servings. 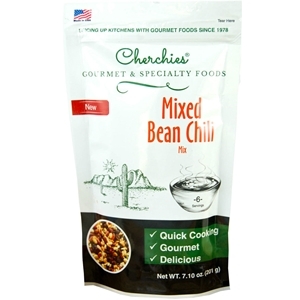 Dried navy beans, dried red beans, dried black beans, dried US grade #1 red bell peppers, dried US grade #1 jalapeno peppers, salt, dehydrated vegetables (tomato, onion, garlic, parsley), spices, natural flavors. Silicon dioxide and calcium stearate added to prevent caking). Allergens: None.